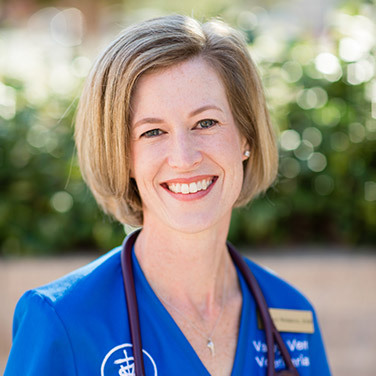 Dr. Stacy Nolasco became the proud owner of Valley Verde Veterinarians in 2016 and is so excited to be in Green Valley! She grew up in Las Cruces, NM and obtained her bachelors degree from the University of New Mexico. She then worked as a veterinary technician in Albuquerque, NM, Washington, DC and Madison, WI. She eventually realized that she wanted to become a veterinarian and attended the School of Veterinary Medicine at the University of Wisconsin- Madison. She cheered on the Badgers while she studied and earned her Doctorate in Veterinary Medicine in 2009. She then moved away from the snow to sunny Tucson where she was an associate veterinarian in a small animal hospital for 7 years. Her goal was always to own her own practice and was so lucky to find Valley Verde Veterinarians, along with her amazing staff, clients and patients. Her veterinary interests include dentistry, anesthesia and internal medicine. When she’s not being a doctor she’s spending time with her husband, chasing around their toddler son, and snuggling her Pit Bull, Ginger.